Hornet Extermination Long Island | EcoTech Pest Control Inc.
HORNETS are identifiable by their large dry paper Mache like nests. The nests may be hanging from a branch or built up against the corner of a structure, such as where the wall and eves of a house or garage meet. The nest will have one perfectly round hole near the bottom that serves as an entrance and exit into and out of the nest. The nest consists of an egg laying queen and drones that groom and feed the larvae and queen, collect food, build the nest and protect the colony. The drones will fly out and chew pieces of bark, dead wood and leaves, mix it with saliva and create a paste that they use to build additions to the nest. There will be constant in and out activity with “guards” circling and crawling on the outside of the nest. This makes it extremely difficult and dangerous to attempt to treat the nest without getting attacked. IT IS HIGHLY RECOMMENDED THAT YOU DO NOT APPROACH A HORNETS NEST UNLESS YOU HAVE HAD THE PROPER TRAINING AND HAVE THE PROPER SAFETY GEAR. IF YOU BELIEVE YOU HAVE HORNETS, YOU SHOULD CALL A PROFESSIONAL IMMEDIATELY. 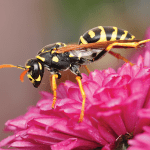 A TRAINED ECOTECH PROFESSIONAL WILL ELIMINATE THE COLONY AND REMOVE THE NEST WITHOUT ENDANGERING YOUR FAMILY TO THE HORNETS OR EXPOSING YOU OR YOUR LOVED ONES TO HARMFUL CHEMICALS.